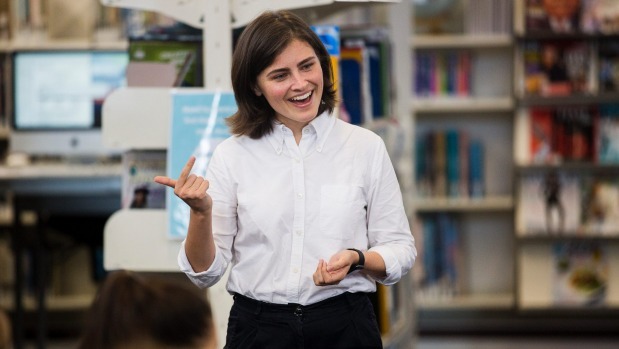 “When you are young you think adults know the meaning of life,” Chloe Swarbrick tells a room full of high school girls. “What you find out – I’m sorry to tell you this – but nobody really knows what is going on,” the Green Party candidate and former Auckland mayoralty hopeful says. The 22-year-old spoke to a group of about 40 pupils from Palmerston North Girls’ High School on Friday and told them they could do anything they wanted. Speaking in the school library, a building adorned with the image of Nobel Peace Prize winner Malala Yousafzai, whose advocacy for women’s education saw her shot in the head by the Taliban, Swarbrick told them to challenge the way things were run. She recalled speaking to other candidates during the mayoral election. Swarbrick said young people were engaged in political issues, but had lost faith in the institutions. During the talk, pupils put the hard questions to Swarbrick, asking if a coalition with Labour would compromise Green values, and if she was disadvantaged because of her age and gender. Year 12 pupil Nomuna Amarbat said the talk inspired her. She also agreed with Swarbrick that politicians only appealed to people every three years. Year 10 pupil Amy Pereira said she was inspired by Swarbrick’s attitude to try things and not be afraid to fail. Pereira said she had not held a strong interest in politics – “but after this I might now”.